Bring the beauty of oak trees to your yard with the Whitehall Oak Leaf Suet Feeder. This lovely feeder seamlessly blends a natural motif with manmade, sturdy elements. Two interlocking, aluminum panels form this versatile unit, topped by a significant, rectangular roof. Three oak leaf shapes, along with two acorn figures, rest in a circle on each of the panels. These renderings create a matrix of small openings through which birds feed. Place a standard suet or seed cake in this holder, and the openings offer birds places to reach the food while preventing waste. The large roof protects the suet from the elements, and a loop at its top enables the item to hang. 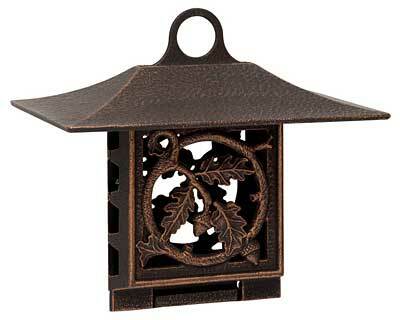 A hammered finish on the piece adds depth, and the dark bronze color meshes with your garden. Additional, lighter bronze hues reflect sunlight for a dazzling unit. One side of this item hinges open, to refill it with suet easily, and the all aluminum construction is made to withstand the elements. Create an elegant station in your bird garden using this Oak Leaf Suet Feeder. Made in the USA. Green Esteem Extended Reach Wall Bracket, Black, 37"